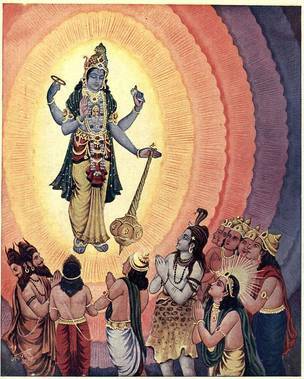 ALavandhAr rues himself saying “brahmA, Siva, sages like sanaka et al get drowned right at the shore of the ocean of bhagavAn when trying to praise him; but I set out to comprehensively praise such bhagavAn”, and withdraws from the effort as arjuna gave up fighting after setting out to fight as said in SrI bhagavath gIthA 1.47 “visrujya saSaram chApam” (dropped the bow along with the arrows). It is impossible for Siva, brahmA et al to truly measure even a small atom in a droplet of the ocean of greatness of that emperumAn. I who has set out to do [sing] praises about such emperumAn’s greatness shamelessly claiming to be a poet, should salute myself [for this laughable effort]. thathvEna – ISwara’s svarUpa (nature) etc [forms, qualities, activities] as they are. yaysa – He who is famous for his endless qualities as said in mathsya purANam and varAha purAnam 74.40 “yathA rathnAni jaladhE: …” (Like the gems in the ocean are countless, emperumAn‘s qualities are also countless). mahima arNava SIkarANu: – An atom of the ocean of qualities; the small portion that came into contact from a droplet; very insignificant portion. mAthum na Sakya: – Cannot even be comprehended by the mind. Sarva pithAmahAdhyair api – (Sarva) by rudhra who has great knowledge as said in mathsya purANam 67.41 “… ISwarAth gyAnamanvichchEth …” (One should pray to sUrya for health, agni for wealth, Siva for knowledge and nArAyaNa for liberation) and is said to be “sarva samharthA” (destroyer of all); (pithAmaha) and by brahmA who is the teacher of rudhra and creator of the [material] universe; Adhi (and so on) indicates sages such as sanaka who are fully focussed on bhagavAn and vEdham which is meant to give good advice to all [None of these can grasp even an atomic portion of emperumAn‘s greatness]; [this incapability is attributed to these personalities] since it is explained in 8th SlOkam “sadhA sthuvantha: vEdhA:” (vEdhams are always praising you) and in 47th SlOkam “vidhi Siva sanakAdhyai:” (for brahmA, rudhra and sages such as sanaka et al). thadhIya mahima sthuthim karthum udhyathAya – Not only I set out to comprehensively praise his glories, I also try to sing non-existing glories of him. mahyam namO’sthu – Instead of saluting emperumAn, I should be saluting myself for attempting such an impossible task. kavayE – [Poet] who tries to narrate different aspects. nirapathrapAya – Being shameless. For not feeling shameful thinking “My glorification of him will only bring disrepute to him [due to my lowly nature]”. This entry was posted in Other, sthOthra rathnam on December 20, 2016 by Sarathy Thothathri.